Incredible brains and great tongue. (We’re talking Persian sandwiches – what did you think we were talking about?) It’s what everyone’s digging into at Aria Persian Fast Food. They sizzle them to order on the hot plate before piling it all into a soft torpedo roll covered in sesame seeds. This is Persian street food, the kind of cheap and hearty fare you can still find on the streets of Iran. 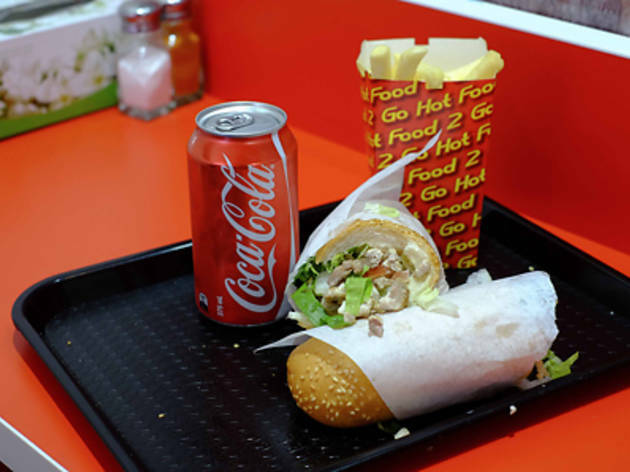 There are six traditional Persian sandwiches to choose from, but the brain-and-tongue combo ($8.99) is the local favourite. It’s better than it sounds. The sheep tongue is impressively tender and the sheep brain is lusciously creamy. Trust us – it’s good. The whole shebang is jammed with slices of fresh tomato, shredded lettuce and spears of salty pickled cucumber. The rolls are massive too – about a foot long – but they’ll cut them in half for easier eating if you ask. 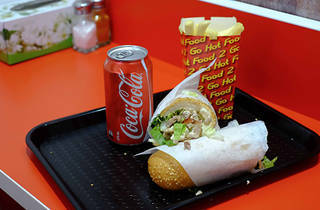 You can order your sandwich to go or grab a high stool at one of the tables running the length of this casual takeaway. The crowd is a mix of Iranian and Afghani ex-pats – mostly young blokes – but staff are eager to help with questions if you have them. If brains and tongue don’t float your boat, there are less intimidating options. The bandari ($6.99) is a Persian sausage that tastes like a skinless hotdog. Check out the beef cutlet ($6.99), a deep-fried patty of mashed potato mixed with mince, or try the olvieh ($5.99), a creamy potato salad perked up with chicken, boiled eggs, peas and carrots. If you’re still craving offal, the chicken liver ($6.99) is a cracker, still moist and smothered in a rich tomato and onion sauce. Vegetarians can revel in Persian-style falafel ($5.99), parsley-free and chunkier in texture compared to its Lebanese cousin. Still want more? They’re flipping burgers, cooking steak sandwiches and serving up Persian hot dogs too. Fork out an extra three bucks on any meal and you’ll score a can of drink and a bucket of hot chips. That’s lunch sorted for no more than $12. Sweet.